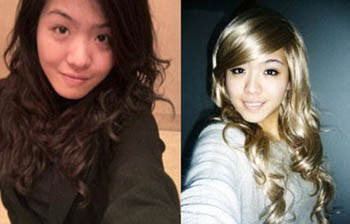 A 21 years old Chinese woman decided to get plastic surgery to look like Jessica Alba to win back her love. Yes, you heard that right. Her boyfriend is obsessed with the Hollywood actress and he would go to the extreme of dressing his girlfriend to look just like Jessica Alba. When she refused, he dumped her. And out of stupidity, she wants to win back his love by undergo plastic surgery to look just like Jessica Alba. I think the dude has an obsession problem but the girl seriously need help! Aw I think that wig she's wearing is so pretty!! Haha. She's crazy to do the surgeries.... girl needs some help! I think she is really pretty as she is, and what's up with that guy being so obsessed with an actress that he dumb his girlfriend, because she doesn't want to change how she looks. And then she does it anyway! What a sad story of how the media can affect in a bad way.. So, what happened after all? It's been almost an year now... Did the woman go on with the surgery?